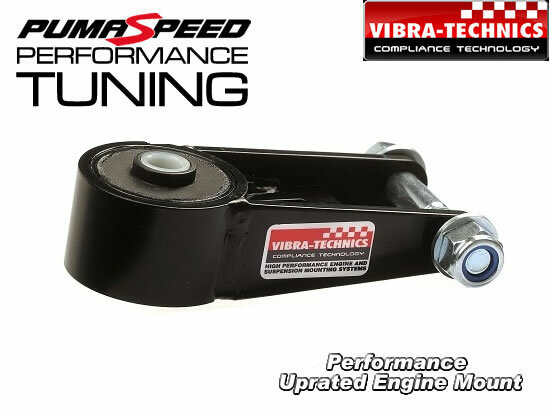 Vibra Technics Performance Uprated Engine Mount For The Ford Focus RS. Vibra Technics Performance Uprated Engine Mounts have been designed for high performance applications where a direct replacement for the standard mount is required along with a much higher level of engine control to cope with higher engine outputs, and higher road inputs caused by fast driving. The fast road mounts give significant improvements in ride and handling without adversely affecting vibration isolation. Strong enough for engine support during hard driving, but compliant enough for daily road use. Vibra Technics uprated engine mounts are manufactured primarily from natural rubber compounds and occasionally from blends of synthetic and natural rubber to give particular properties for specific applications. Extensive experience and testing in all kinds of environmental conditions by automobile manufacturers has shown that only natural rubber compounds give optimum performance and durability, which is why it is still universally used today by every car manufacturer. Where the rubber needs to be attached to metal components, this is achieved by chemically bonding the rubber to the metal during the molding process, using the latest chemical adhesive systems. Fitting Vibra Technics Performance Engine Mounts give a performance advantage to any fast road car. Vibra-Technics Automotive was originally established to produce high quality engine mounts for high performance sports cars, built by smaller specialist car manufacturers. Racing and fast road saloon car mounts were then developed for a variety of makes and models, and this has grown the business to where they now offer over 50 specific products for high performance cars, with more general products which can be used in a variety of applications from V8 engined kit cars to ATV's. Vibra-Technics Automotive technical staff have collected over 30 years experience in the design of rubber components used in the automotive Industry. Their experience has been gained working for a number of multi-national rubber companies engaged in the design and manufacture of chassis components used by all the major automobile manufacturers. This experience means that when you fit a Vibra Technics engine mount, you can be sure you are fitting the best. The Pumaspeed Workshop team are ready to fit the Vibra Technics Performance Uprated Engine Mount for the Focus RS MK3 in our Head Office located here. Therefore making parts and labour a total cost £116.50 (inc. VAT). Pumaspeed have a specialist distribution team that can dispatch the Vibra Technics Performance Uprated Engine Mount for the Focus RS MK3 to any destination worldwide.